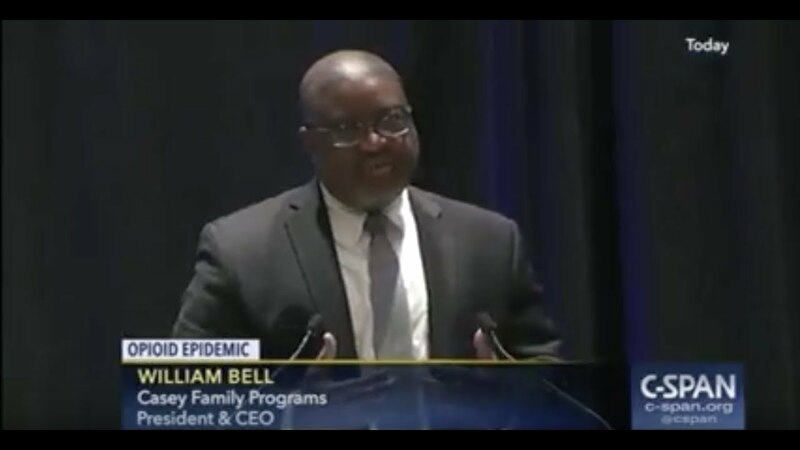 Dr. William C. Bell spoke at the National Governors Association 2017 Summer Meeting regarding the nation’s opioid epidemic and its impact on children and families. He encouraged the governors to take a collaborative approach to the crisis, working together with all levels of government as well as business, the nonprofit sector, philanthropy and the community. Thank you. Thank you all for your leadership. I want to say thank you to NGA, as you have continued to push the leadership role of governors in the nation. I don’t think that there’s any greater call than to tackle this issue of addiction. I am so thrilled listening to your leadership and listening to the direction that you have already chosen to go, and the ownership you have taken for this challenge. Because at Casey Family Programs, which is the sister foundation of Annie E. Casey, we believe that one of the greatest challenges facing this nation today is the erosion of hope in the lives of our citizens, and that many of the challenges that we are facing are directly connected to the lack of hope that some of our families are facing. But I heard something here today that I think we all need to hold onto. These are people. These are our people. They need to know that we care about them. I was in New York City during the ’80s when the crack epidemic hit. Unfortunately, we tried to punish people out of drug use, and we didn’t see what someone said here today, which is, this is a disease. Recovery is possible, but treatment is necessary. The underlying point that I heard here today is that we are not just talking about individuals addicted to a substance. We are actually talking about sons and daughters and uncles and aunts and mothers and fathers and brothers and sisters. For every addicted person that we will encounter, there is a family standing behind that addiction. There is a father afraid that his son is going to die. There is a brother who – as I had to do in 2010 – go and bury his deceased brother. There is a community that watched this young man or this young woman grow up expecting great things from them that one day they were going to be the leaders that would replace you, who have to come face-to-face with the fact that that might not be possible. And so I stand here today to applaud you for your leadership, but I want to encourage you to keep reaching up because the federal government has to step in and support you and what you’re doing. But I also want to encourage you to reach down, because from your seat, you need to engage the mayors and the local city leaders who are responsible for these same citizens in those communities, and get them also on board with what you are trying to get done. Because as was said from this panel, we cannot do this alone. We cannot do this from a single department. The business sector can’t do this by itself. The elected government sector cannot do this by itself. The not-for-profit sector, which I include faith-based in there, can’t do it by itself. We also need to engage philanthropy, who cannot do it by itself. We can make grants, but we cannot grant our way out of this. We’ve got to come together as one group, and that group has to include a fifth sector – and the fifth sector is the community; the community that surrounds these people, who’s touched them every day; who has changed their diapers. We need to engage in a way that says we cannot rest until this is over. And we cannot give up on a single soul, no matter how many times they relapse. We can beat this. We have a history of winning. And this is no different. But we cannot give up. We cannot declare it done. We cannot say, well, we fixed this neighborhood, and therefore we can use this money to go someplace else. We have got to rebuild from the ground up. I will give you two numbers. One is 25 minutes. Every 25 minutes a baby is born in the U.S. who is suffering from withdrawal from opioid addiction. That means that during the time of this conversation – this very inspiring and very encouraging discussion – three babies have been born suffering from withdrawal from opioids. That means that by the time we finish this three-day convening, 173 babies would have been born suffering from opioid withdrawal, dramatizing how serious this is and how we cannot rest until we get all of the solutions working for us, and that we can keep moving forward together saving as many as we can, but understanding that the longer that we wait, the more casualties that we are going to experience. And the second number that I’ll give you is one-third. That number is significant. In 1999 there were 567,000 children in foster care across this country. Casey Family Programs, along with others, started and endeavor called, Building Communities of Hope, which is an effort to change what is going on in communities so children don’t have to come into foster care when families face challenges, and we can serve them at home. From 1999 until 2012, there was a 30 percent reduction in the number of kids in foster care. It had gone from 567,000 children in foster care to 390,000 children in foster care. From 2012 to today, that number has gone back up to almost 430,000 children in foster care. It is heading in the wrong direction, and children who spend their lives in foster care have some of the worst life outcomes than any other children in the nation, including those that are chronically poor. We must see the faces of these babies. And I encourage you to reach out to your other colleagues. Every governor should be in this room on this issue. And we need to make sure that the federal government is in it. And I will tell you, philanthropy is in on this issue. Casey Family Programs will be a resource. It doesn’t cost any of your states anything. We bring the resources that we have gotten from the late Jim Casey, the founder of UPS, and give them to your states. Right now, we work with every one of your child welfare agencies to make sure we are not leaving any of our children on the playing field. We can’t leave them behind because they need to be leading this charge as we go forward. And the challenge is for us to continue to remember that these are people. And that one-third number – one-third of all of the placements that are made – that were made in this last year – over 200,000 children coming into foster care – one-third of the cases had parental substance abuse as a reason for removal.